Stars form when dense cores of gas collapse inside molecular clouds. To measure the star formation rate in nearby clouds, like the Taurus Molecular Cloud, we can simply count up the number of newly formed stars. To measure star formation in distant galaxies, we do not have this luxury. We must rely on integrated properties – such as H-alpha emission – to trace the overall star formation rate in the galaxy. Because dense gas forms stars, there is a well-known observed relation between the star-formation rate and gas density. This observed relationship is the famous Kennicutt-Schmidt law. Described in this Astrobite, the Kennicutt-Schmidt law is often used in galaxy evolution models in order to convert gas density to star formation rate to compare with observations. But the Kennicutt-Schmidt law only relates the average gas density in a galaxy to the star-formation rate. In reality, only the densest gas clumps in larger clouds form stars, so a more physical treatment would relate the distribution of gas densities to the observed star formation rate. This is the goal of today’s paper: a more physically realistic star formation law that works in our galaxy and beyond. One of the major problems in star-formation theory has been to understand why star formation is so inefficient. Only about 1% of gas in molecular clouds is converted to stars. The updated star formation law presented by the authors relies on the recent consensus that turbulence – random particle motions – is crucial for preventing too much gas from collapsing into stars. Check out this Astrobite for a video that shows how important turbulence is for regulating star formation and take a look at this article for an artistic treatment of turbulence. How do we define just how turbulent a gas is? One way is to use the Mach number of the gas. The Mach number is a measure of the turbulent motions in the gas compared to the speed of sound, and can be determined by observing the width of emission lines from molecules such as carbon monoxide. The higher the Mach number, the more turbulent the gas, and the greater range in gas densities in the cloud. Therefore, a higher Mach number means more gas will have sufficient density to collapse into stars, resulting in a higher star formation rate. This relation between Mach number and density variance forms the basis for a new star formation law. By comparing the star formation rate to the amount of gas consumption expected given the distribution of densities in the gas – as governed by turbulence – the authors fit observations of clouds in the Milky Way to determine the new star formation law. 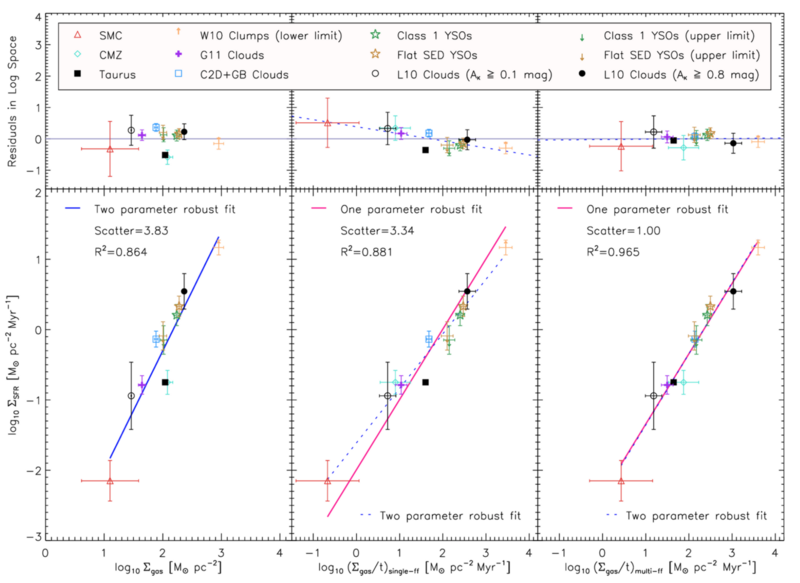 The figure below shows how the Kennicutt-Schmidt law (far left), which simply compares gas density to star formation rate, compares to the newly derived star formation law (far right). Because the variation in Mach number is taken into account, the scatter in the new relation is reduced by a factor of 3-4 compared to the Kennicutt-Schmidt law. 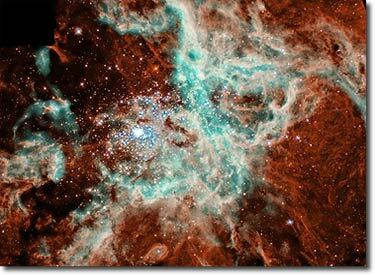 Star-formation laws. The Kennicutt-Schmidt law is on the far left, while the authors’ new law is on the far right. The points represent observations of star forming regions in the Milky Way and Small Magellanic Cloud that span several orders of magnitude in gas density and star formation rate. Including turbulence by way of the Mach number produces a more physically realistic relation with less scatter. In the Milky Way, the Mach number is determined by measuring turbulent velocity width and gas temperature using high-resolution molecular emission line maps. This is very difficult for other galaxies. By inverting the new star-formation law, the Mach number can be predicted for these distant systems if star formation rate and gas density have been measured. Specifically, the authors predict that starburst galaxies at high redshift have more turbulent gas than local spiral galaxies. As Arthur Dent could tell you, turbulence is a strange beast, but a deep study of this phenomenon is important in understanding how gas turns into stars, in our galaxy and beyond.